Have you ever tossed and turned at night, inspired by a possibly impossible sewing project, mentally working out the details and keeping yourself up past bedtime? This Chevron Hem Skirt kept me up many many nights. I filled my Fashionary with incomprehensible notes and sketches. I practiced on scrap fabric. I considered never doing it so I wouldn't "waste" fabric. But now, I'm so glad I took it on and created a unique skirt that I love! 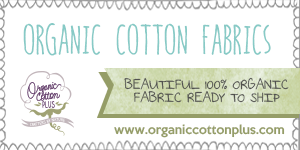 If you've heard of Girl Charlee Fabrics, then chances are that you have at least one of their chevron knits. I used the black chevron on pink for the Ashley Dress for AB, and I received this "Oxford Blue" on white in my bargain box last month. I know it looks black in the photos (and IRL if you want to know the truth!) but I promise it's navy. The teal on the reverse side is also from Girl Charlee and is a cotton/spandex knit. Any skirt pattern OR skirt you own that fits. The pattern or skirt must have a straight hem. No circle skirts or curved hems! Enough fabric for two skirts. Thread to coordinate with each of your fabrics. 3/4" elastic, long enough to go around your waist plus a little extra. 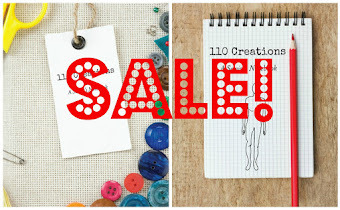 Scissors, pins, marking tools, sewing machine, etc. If anything is confusing about this tutorial, leave a comment and I'll be happy to explain further! To start, cut out a front and back skirt piece from each of your two fabrics. I only had one yard of the teal blue knit, so I had to be creative in my cutting. I used an A-line RTW skirt as my template (you could also do this in a maxi length if you had enough fabric). This photo is with my selvedge end folded to the middle. The skirt is also folded in half and placed on the fabric fold. As you can see, the end goes off the fabric. The bottom hem is also curved. These are problems. To fix both of these problems, I squished the overlap over until it was back on the folded fabric. I used chalk and traced a rough outline from the waistline to the hem. This is the side seam. Then I drew a STRAIGHT line from the fold to my side seam. This cut piece of fabric became my "pattern piece" so to speak. I used it, instead of the white skirt, to cut my remaining pieces. Again, you need a front and back from each fabric. When it comes time to cut the chevron pieces, be aware that the final skirt will lose two tiers of chevrons. I cut out knowing that my skirt would end up shorter than my white template skirt. I wanted the bottom of my skirt to be the navy chevron, so I cut with navy on the bottom. That way I would lose navy, white, and the next navy piece would be my final hem. This will make sense when it comes time to hem, I promise! You must be careful to cut two identical skirt pieces from the chevron. I cut one piece on the fold, then used that piece and laid it on top of my fabric. I matched up the pattern on the hem, both side seams, and the waistband. Match chevrons along all four sides. Pins are your friend! Use lots! Can you tell that this is a photo of one skirt piece laid on top of fabric? No? Good! That's what you want. If you don't cut an identical piece, then your side seams will look wonky. When I was done, I had two blue skirt pieces and two chevron skirt pieces. Next, place your matching pieces (teal with teal, chevron with chevron) right sides together and sew up the side seams. I used my serger and it matched my chevrons in a most heavenly way, without pinning! (Srsly go buy a serger.) When you're done, you'll have two skirt "shells". Turn the chevron skirt inside out, and the solid lining piece right side out. Put the lining skirt inside of the chevron skirt. This makes them right sides together. Match the side seams as shown above, and match the hems as shown below. 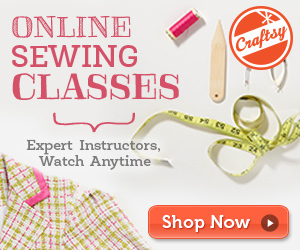 Ready to spend some time at your sewing machine? Before you start, chose your thread color wisely. You'll be sewing a seam which will not be visible, BUT...it's always better to be careful. Use cream or something not too obvious. I used navy because I plan on wearing the chevron side out the most. Go to your sewing machine and slide the hem in, with the chevron side up. 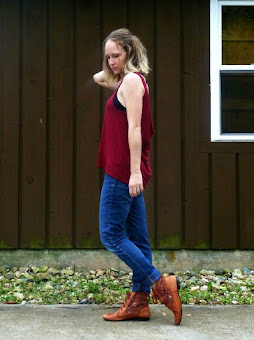 Make sure both hems still match up along the bottom. You will be stitching on the third tier of chevrons. Remember how I said you'll lose the first two tiers? Stitch just inside the chevron on the third tier. You don't want to be exactly on the edge between the dark and the white, since you may have some white show through accidentally. 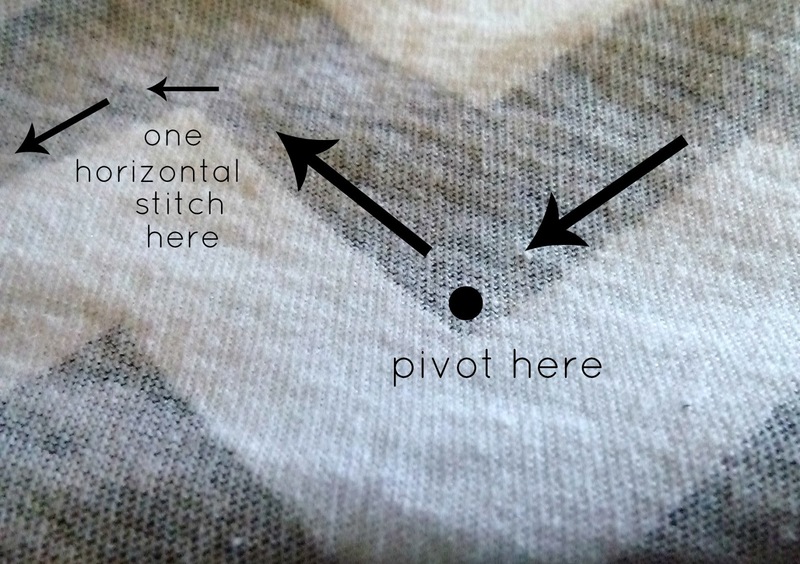 Start your stitching in the side of a chevron, not directly in a point (see above photo). When you come to a bottom point, lift your presser foot, pivot your fabric, and start back up. When you come within one stitch of a top point, stop, lift your presser foot, and pivot your fabric so that you take one stitch horizontally across the top of the point. Hopefully this graphic will explain it in case my words do not! You may find out quickly that this is somewhat tedious work, but once you get into a groove it's not so bad. Unlike a lot of sewing projects, the hard part is up front, and you get to see results fairly quickly! Once your hem is stitched all the way around, take your scissors and trim off the two bottom tiers. Don't cut into your stitches! In order to make pretty points, you'll need to clip into the seam allowance in the top points, and cut across the bottom points. Don't cut into your stitches! Make sure that the tip of your scissors is where you want them to be before you cut. Come as close as you can without cutting your stitches. Did I mention not to cut your stitches? Now it's time for the fun part!! 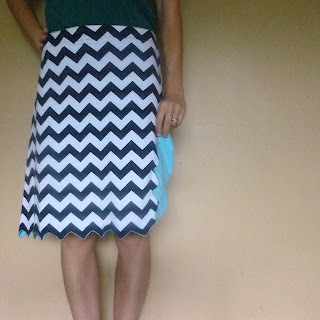 Turn your skirt so the chevron fabric is right side out. Get your fingers down between the two layers and poke out all the little triangles. Use a point turner if you have one, or a wooden grill skewer (the flat end) if you're me and too cheap to spring for a point turner. Once you have them mostly out, you can kind of roll the points between your fingers. That flattens the seam allowances inside the points. Next, PRESS! Press it good. Test a scrap first to make sure you don't have any shine issues when pressed. Now. The next part I'm going to SAY is optional...but it's not really. If you're cool with how...floppy...the points are after pressing, you can move on to finishing the waistband. But if you have the time, you should topstitch. It makes the points much more crisp and helps them stay flat.. Look how nice it looks! BEFORE you topstitch...here's your second chance to pay careful attention to your thread. On my skirt, I wanted my topstitching thread to match on both sides. To accomplish that, I used navy thread on top, and teal thread in the bobbin, and sewed with the chevrons up. That makes my navy thread show only on the chevrons, and my teal bobbin thread underneath on the teal skirt. It's a little tedious topstitching all those zig-zags, but again, you'll get in the groove and be done in no time. Press your topstitching well once complete. Almost done! All that's left now is the waistband. First, smooth your layers as much as possible, and check to see that they're even at the top. Cut off any excess and even them up. Once you know they match up, you can decide how you want to finish the waistband. If you'd like a yoga-style, where the inside folds to the outside (which is fun if you want contrasting colors!) then finish the edges together. For example, serge or zig-zag the teal to the chevron, and then fold over. Your top edges can be concealed inside the folds. I wanted a regular elastic casing waistband for my skirt, without contrasting colors. I used 3/4" elastic. Normally, you would fold the outside to the inside and create a casing, but since the skirt is reversible, you need a different approach. Lay out your skirt and place your elastic on top. Once that's done, either use a ruler or the elastic as a guide and mark right above it. In the photo above, you can see my bottom stitching line, and the white mark (I used soap!) above the elastic. Make sure you're not right on the elastic, a little wiggle room above it will let you feed the elastic neatly. Mark this top line all the way around your skirt on the chevron side. DO NOT SEW IT. Now, working only on the chevron skirt, fold along your marked line to the wrong side of the chevron fabric only. Pin. Check all the way around and make sure you still have room for the elastic (in my case, I made sure I had 3/4"). Next, work on the other skirt piece and fold it to its wrong side as well, evening it up with the chevron skirt. Pin all the way around the second skirt. You should have two skirt tops which are pinned separately. Next, slowly pin both layers together at the folds, keeping the folded parts down and tucked into what will become your casing. Continue to use two different colored threads as described above. Keep the tops as evenly together as possible, or you may not catch the bottom layer (ask me how I know!). Don't stitch too low, or your casing will be too narrow and your elastic won't fit. Leave an opening in order to insert your elastic. Cut a piece of elastic the width of your waist, plus an inch extra. Thread it into the casing using a safety pin or a bodkin. Once your elastic is through, overlap it a bit and safety pin the ends together. Try on the skirt and adjust the elastic for a perfect fit. I like to mark where the overlapped end goes and then remove the safety pin in order to sew the elastic together. I typically use a three-step zig-zag stitch on my overlapped elastic ends, but a regular zig-zag works fine. Evenly distribute the elastic throughout the casing, and then finish edgestitching your opening closed. You're done! That wasn't so bad, was it? And now you have an awesome chevron skirt PLUS a great alternate skirt inside it. Any questions? 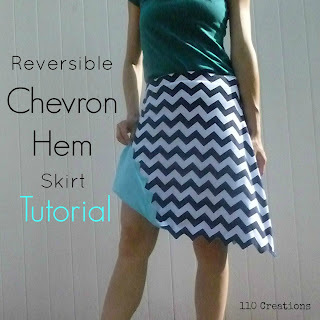 If you make a reversible chevron hem skirt, I'd love to see it! Feel free to link in the comments! Awesome tutorial and beautiful skirts. Thanks for sharing. Thank you so much! I hope it was all clear. This is great. 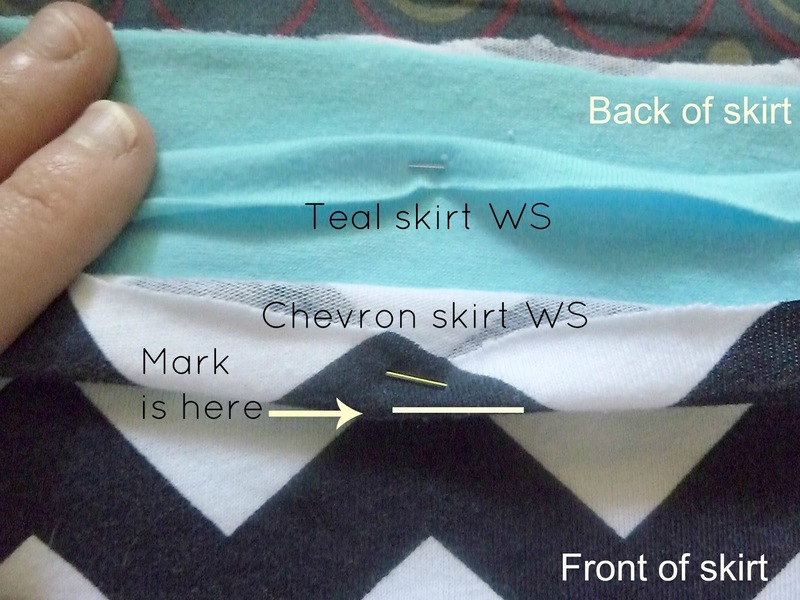 I don't plan to make a chevron skirt, but I am really glad to find such clear directions--with pictures--of making an elastic waistband for a reversible skirt. Thanks! You're welcome! It's not too difficult, just a bit tricky to hold everything together.